Runtime: 3 hr. 0 mins. 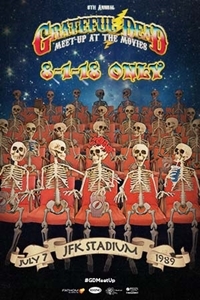 Celebrate the 8th Annual Grateful Dead Meet-Up at the Movies when Fathom Events and Rhino Entertainment, bring the complete July 7, 1989 concert recorded at John F. Kennedy Stadium in Philadelphia to movie theatres nationwide. This special one-night event offers a snapshot of the Dead's 1989 tour, where the band played to some of its biggest audiences ever and helped raze the aging stadium, thundering through "Hell In A Bucket," "Little Red Rooster", Bob Dylan's "Stuck Inside Of Mobile With The Memphis Blues Again", and closed the show with "Knockin' On Heaven's Door," the last song ever performed at JFK.